I have just started teaching a revision course for the L1 Functional Skills writing exam. After spending most of last week’s session boring the students to death with a pile of worksheets I promised the students that I’d make this lesson more appealing. The sessions was based around the topic of planning skills and as I’d heard about a constantly successful lesson based on film trailers which had been really well received by the students I decided to adapt the idea for my session. From previous encounters with the students I knew that they all enjoyed watching films so I decided to base the lesson around planning a film review. A week early, the first group that I taught this session with, had completed a free writing exercise with their normal tutor based on the film Hancock so I decided to build upon this activity and based my session around the same film. The warmer was an A-Z Quiz that I’d found on Skills Workshop. In order to prevent copying and to promote individual thinking skills I split the class into pairs, giving one student having a worksheet based on the A-Z on famous people and the other student the A-Z of film names. To add a bit of friendly competition I gave a prize for the first student to complete their sheet. I introduced the lesson by talking about the planning process and why it was it’s such an important stage of the writing process. After discussing planning strategies the class then went on to complete a card match activity looking at the stages of writing and describing each process. We then discussed the activity of writing a film review. To support the class with their writing we began by refreshing our memories about the film by watching the film trailer. The main story lines are? I enjoyed watching this film because? I would recommend this film because? I explained to the class that we were going to generate ideas as a group to help them complete their individual film review. Each pair was then given one of the headed sheets and began writing their ideas on post it notes and then sticking them to it. The afternoon group wanted to work as a production line so they each wrote a few sticky notes and placed them on to their sheet, they then passed it down the line and continued adding notes to the next sheet and so on until they ran out of ideas. Once the sheets were complete we discussed the answers as a class and then placed on to tables at the side so they could be referred to it if the students developed writers block whilst completing their film review. In the second group all of the students hadn’t watched Hancock so we based the exercise on the Men in Black instead. This entry was posted in PGCE, Resources and tagged Functional Skills, Literacy, Planning, Resources, Writing by Gemma H. Bookmark the permalink. Brilliant work Gemma and thanks again for the resources you have uploaded. Thanks for posting this resource Gemma – helped me massively today when I had to cover a class! 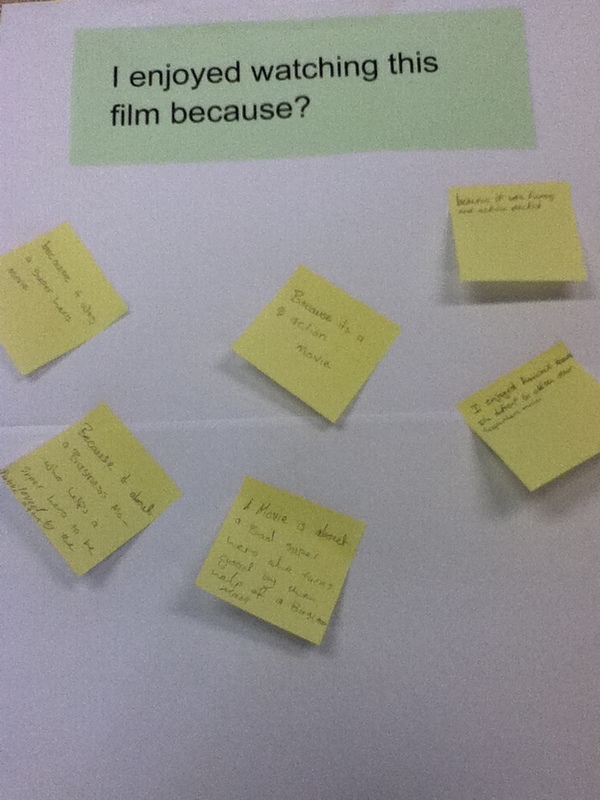 The groups really enjoy it and learners wrote some great film reviews – I’ll def be doing this lesson again. Thanks for the comment. Glad you liked it. It’s my favourite lesson.